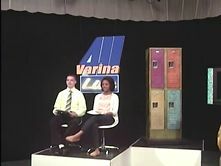 Check out the latest episode of “Varina 411 Live” from November 2012. After the JV football team (6-1) won their first district game against the Lee-Davis Confederates with a score of 30-0, being undefeated in the district became their goal. The clock ran out with the score tied 17-17 in Varina’s game against Hermitage. Administrators have established new academic expectations for all student-athletes.